We’d love your help. Let us know what’s wrong with this preview of The Trouble with Werewolves by M.B. Mulhall. Ellie Weston may look like a blonde Barbie wanna-be, but call by her full name of Elvira and you’ll find she can take you down with nothing more than a paperclip and a hair tie. Having been raised by an ancient vampire, a faerie and a demon hardly makes her a normal teen. She’s trained in self-defense, with a bit of magic thrown in, but those talents are going to waste as Ellie Weston may look like a blonde Barbie wanna-be, but call by her full name of Elvira and you’ll find she can take you down with nothing more than a paperclip and a hair tie. Having been raised by an ancient vampire, a faerie and a demon hardly makes her a normal teen. She’s trained in self-defense, with a bit of magic thrown in, but those talents are going to waste as she picks up dry cleaning, walks three-headed dogs and collects grave dust by the light of the full moon. To ask other readers questions about The Trouble with Werewolves, please sign up. Vampires, demons, and werewolves oh my! 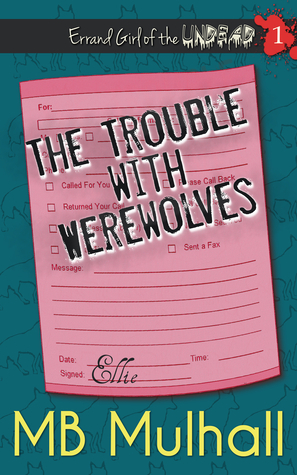 The Trouble With Werewolves is a fun, fast-paced story with an original premise. As the adopted daughter of a powerful vampire, Ellie is an errand girl to all manner of supernatural creatures. There was a nice balance of action, mystery, and humour in this story. Ellie is funny and smart, and while she has lots of personality, I’m hoping we’ll see more depth and growth from her in future books. I’m also looking forward to seeing where things go with the hi Vampires, demons, and werewolves oh my! The Trouble With Werewolves is a fun, fast-paced story with an original premise. As the adopted daughter of a powerful vampire, Ellie is an errand girl to all manner of supernatural creatures. There was a nice balance of action, mystery, and humour in this story. Ellie is funny and smart, and while she has lots of personality, I’m hoping we’ll see more depth and growth from her in future books. I’m also looking forward to seeing where things go with the hint of romance, and the questions that arose toward the end. Given I'm a supernatural creature junkee, I enjoyed this story. Vampires, werewolves, demons, and more! But, also, it was an interesting premise. We've had humans raised by the undead, but never had that human have a job running errands for the supernatural creatures. That gave the story a unique twist and allowed the glimpses into the world Ellie lives in we might not otherwise get if she didn't have to walk a couple of hell houn I was given an ARC by the author in exchange for an honest review. Given I'm a supernatural creature junkee, I enjoyed this story. Vampires, werewolves, demons, and more! But, also, it was an interesting premise. We've had humans raised by the undead, but never had that human have a job running errands for the supernatural creatures. That gave the story a unique twist and allowed the glimpses into the world Ellie lives in we might not otherwise get if she didn't have to walk a couple of hell hounds or take Selkie pelts to the dry cleaner. There are some cliches. You just know Sampson cares deeply about Ellie despite how he acts and it's obvious how he's hiding his feelings (badly at times) and eye rolling how oblivious she is. But I enjoyed the banter between the two. Snark is so much fun. It adds a lightness to the story. The other cliche is the mystery at the end(view spoiler)[ where the bad guy alludes that Ellie's guardian came by her in a not so noble way. (hide spoiler)] But it's one of those cliches were you want to read more to know if it was a big lie and the cliche is being flipped, or if it is just a classic cliche and how will Ellie deal with it. Sometimes, I read cliches and just groan. This wasn't the case. I'd say my main complaint would be the story moved fast. It's a novella, so it's not long to begin with and it flowed smoothly, but I would have like the plot to slow down so I could enjoy the world more and get to know the characters better. I got the gist of who they were, but I think a little more fleshing out would have been nice. This was a fun, easy read that was recommended to me. Ellie Weston has been raised by a vampire, and spends her evenings as a self named “Errand girl to the undead.” Although, it's not just undead she runs errands for. If you're part of the supernatural world and can't handle your errands yourself, Ellie is your girl. Pick up dry cleaning? Check. Water lawns for those out of town? Check. Track down rogue Werewolves? Check. And that's where Ellie runs into trouble. There's a vamp looking to take This was a fun, easy read that was recommended to me. Ellie Weston has been raised by a vampire, and spends her evenings as a self named “Errand girl to the undead.” Although, it's not just undead she runs errands for. If you're part of the supernatural world and can't handle your errands yourself, Ellie is your girl. Pick up dry cleaning? Check. Water lawns for those out of town? Check. Track down rogue Werewolves? Check. And that's where Ellie runs into trouble. There's a vamp looking to take care of a rogue werewolf, but the entire thing goes weird. With the help of Samson, a blue furred demon, Ellie figures out what's going on with the werewolf, without getting herself on the menu. Loved it! This is really my type of story! I thought the idea of a human girl running errands for the undead was quite original too. I really loved Samson (my favorite character) and Josiah (my second favorite). Josiah can be very sweet to Elvira and I adore reading about parent-child relationships. Samson is somewhat mysterious, at least to me, which makes him even more interesting and likable! On other things, the pacing and tension were great; it never felt too slow or too fast. It was a relie Loved it! This is really my type of story! I thought the idea of a human girl running errands for the undead was quite original too. On other things, the pacing and tension were great; it never felt too slow or too fast. It was a relief to me that there is not much setting description (since I tend to get bored by them), but still enough description for me to not feel "lost" in the story. The prose was smooth and easy to read. The only thing I didn't like that much was that the story ended too soon, in my opinion. I understand that this is a novella, not a novel, and that there will be sequels answering the questions at the end, but still I felt that the last part of the book could have been more developed; the problem was too quickly solved, and the bad guy too quickly defeated. It may just be my own subjective feeling, though. A nice, fast-paced story, with sympathetic characters and good resolution. I particularly liked the sleazy, heart-of-gold demon and the vampire longing for the beach and sipping his blood through a straw with a little paper umbrella. There were little touches like this throughout, that lifted the story above the ordinary, and I do think this writer has real talent. That said, the quality wasn't what I like to see in a published work. Rigorous editing ought to have firmed up the writer's shaky gra A nice, fast-paced story, with sympathetic characters and good resolution. I particularly liked the sleazy, heart-of-gold demon and the vampire longing for the beach and sipping his blood through a straw with a little paper umbrella. There were little touches like this throughout, that lifted the story above the ordinary, and I do think this writer has real talent. As the author, I have to give it a good rating. I really enjoyed writing this series. Ellie is a spunky, sarcastic, fun heroine and I hope more of her adventures will want to be told in the future. MB Mulhall is a published author who typically has way too much on her plate. In between making vlogs and writing books, she tests her patience and pays the bills by helping to manage a home for developmentally disabled adults. She has a BA in Comparative Literature and Languages from Hofstra University as well as an Elementary Education degree from Georgian Court University. She’s a crafter, a pe MB Mulhall is a published author who typically has way too much on her plate. In between making vlogs and writing books, she tests her patience and pays the bills by helping to manage a home for developmentally disabled adults. She has a BA in Comparative Literature and Languages from Hofstra University as well as an Elementary Education degree from Georgian Court University.